New AMD/RYZEN most affordable Gaming PC. * ASUS-PRIME-A320M-A New AMD/RYZEN Board. * Stainless Steel Back I/O. * Superb Performance-Fan Xpert, Active Quiet & Cool. * Speed up your system with M.2. with PCIe 3.0 x4 interface. * eSports Champions:Gaming Audio.Gear up ! with battlefield. * LED-illuminated design/Noise isolation/Audio enjoyment. * SoftRAID Controller supports RAID 0,1,10. * GT-1030/2GB/GDDR5 Gaming Video Card. * DVI-D /HDMI Video output ports. * 1x120mm REAR Fan included. 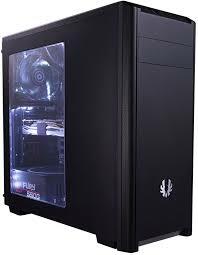 * Thermaltake-500W (80plus)ATX Silent Power Supply. * DVD rewriter drive is option. * Gaming HD-AUDIO 7.1Ch. on Board. * 10/100/1000 GLAN on Board. * WIN-10 Home/64bit DVD/COA. included. * Hardwares up to 5yr. limited warranty. RYZEN-1300X/4C/4wy/3.7Ghz/Boost CPU=$968+TAX.Based on debit payment. RYZEN-1400/4C/8wy/3.4Ghz/Boost CPU=$1018+TAX.Based on debit payment. RYZEN-1600/6C/12wy/3.6Ghz/Boost CPU=$1068+TAX.Based on debit payment. * All CPU's included AMD original Wraith Spire CPU Cooler Fan. *Prices based on cash or interac, and do not include any taxes. Actual system may differ from picture. *Subject to availability, may not be exactly as pictured, we require 50% deposit to start building.